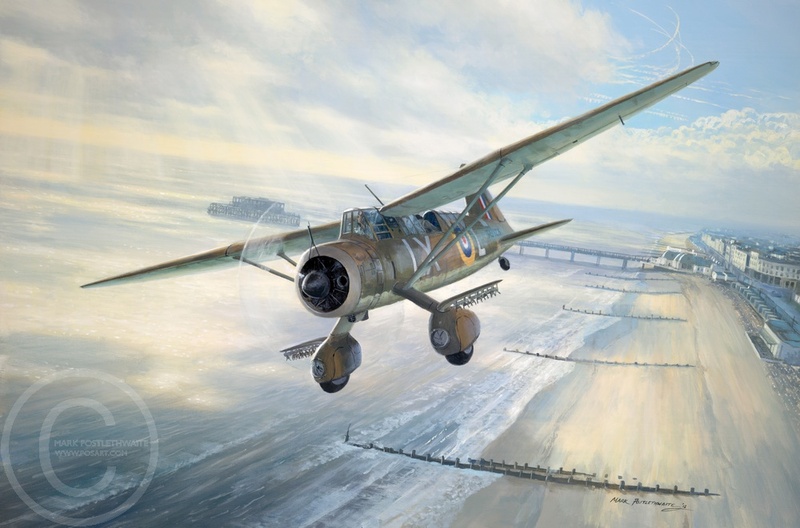 A Westland Lysander of 225 Squadron flies low over Worthing seafront on a beach patrol during the Battle of Britain. This painting is unique as it was a demonstration piece that Mark worked on 'live' during his week's Artist in Residency' at the RAF Museum Hendon in August 2012. He invited many visiting children to help him paint this picture, and their efforts can be seen in the clouds on the right of the picture and in the waves breaking on the seafront. All children signed the back of the original painting, which incidentally depicts the Museum's own Westland Lysander. A full length article about this painting and the story behind it appeared in October 2012's Britain at War magazine.